Temporomandibular joint disorders (TMD) cause pain in the jaw joint and the associated muscles of jaw movement. Because of this TMD can have a serious effect on quality of life. We offer services for treatment of TMJ disorders. These vary and include simple self-care techniques, treatment with splint therapy, and occlusal rehabilitation. If you are experiencing chronic TM joint pain, schedule today to begin treatment and regain control of your life. The temporomandibular joint (TMJ) is combination hinge and sliding joint located on the left and right sides of the jaw. It connects the lower jawbone (mandible) to the temporal bone of the skull. The TMJ is what allows your jaw to move up, down, forward, backward, and side to side. Without this joint, we would not be able to talk, chew, or yawn! What are temporomandibular joint disorders (TMD)? TMDs cause pain in the jaw and the associated muscles of jaw movement. This can result in a decreased amount of jaw opening or difficulty opening the mouth. How do I know if I have TMD? What are the symptoms? I have clicking of my TMJ when I open. Is that normal? Jaw clicking and/or popping is not necessarily a sign of TMD. On its own it is a common finding in the general population. There is no need for TMD treatment if there are no other associated symptoms. The TMJ is a complex joint, and as such the cause of TMDs can be complicated and multifactorial. I am using an occlusal splint, and it has made my symptoms better. What is the next step? An occlusal splint is a noninvasive, reversible therapy. If it is effective, it is recommended to continue using the splint. There is no contraindication to continue using an occlusal splint indefinitely. If you do not wish to use a removable appliance anymore, then permanent occlusal adjustments can be made. This is commonly achieved with crowns on the back biting teeth. However, it should be noted that any occlusal adjustments that are made in this way are nonreversible. What is needed to make my oral appliance? Making your occlusal splint is straightforward and easy. It is no different than the process of making a mouth guard or bleaching trays. 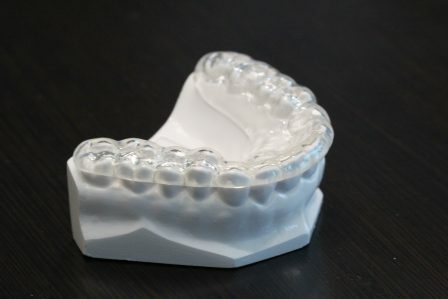 Impression molds will be taken of the upper and lower teeth. After that a recording of your bite will also be taken. These materials will be sent to a laboratory to make your occlusal splint.